Some time ago, scientists discovered that there are planets that do not rotate around any star, like the Earth rotates around the Sun, but “travel” in the universe all alone. Till now, scientists have discovered only less than 10 such planets, but recently, astronomers in Hawaii noticed a hardly visible blue point which they believe to be another such planet. Later, the object was more thoroughly examined with the help of a more powerful telescope in Chili. Scientists suppose that this is probably the closest free-floating celestial body to us a euros ” the distance between it and the Earth is only 100 light years, which is not far from the point of view of cosmic distances. If this planet was formed in a star system, why has it left it? 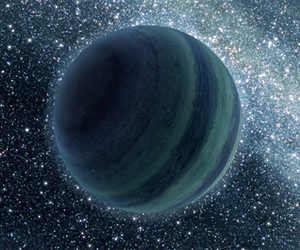 Read more: A stray planet — Space Daily.